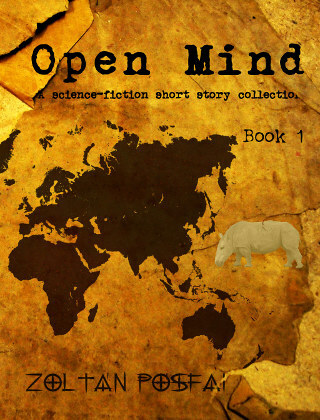 Open Mind – Book 1, is my first collection of short stories published and will hopefully be followed by further issues in the future. Some of the stories are recent, some are older and spent time in the drawer. What is it you should expect if you decide to take this book in your hand? These stories fall into the hard science fiction genre. Not necessarily by being a pure tech story, but by attention to detail. I thrive to make these stories as realistic as the story permits. Many details fall into the Easter Egg category and can provide some good investigation time to those interested in them. We also reached my main goal with these stories. I want you, the reader, to face some unusual problems and situations. Follow them through the story, face extremities and consequences. See how people act, react and handle situations. I promise you will always get some ideas and thoughts to chew on and discuss. Problems are… well, they are problems. Most of my stories are not fairy tales and happy endings. While I hope to achieve a good level of entertainment, my real goal is to make people think, have ideas and face those problems. Hopefully, even if just in your subconscious, you will be more as you handled them and may help you in the future. Spot unusual problems, find solutions off the beaten path or have some revolutionary idea. Thirty-six righteous people: Humanity is in an all out war. Three ‘Blocks’ fight each other, but had to go underground and specialize for such a life as the use of atomics contaminated the surface. David is probably the greatest strategist who has ever lived and capable of winning the war, but something unexpected threatens to end his career. Big Loop: A genius physicist did not only solve the problem of uniting gravity with quantum mechanics, but also found an interesting practical application. He proved the existence of parallel universe and a way to travel to it. A seasoned captain is hired to lead the first experiment in secrecy. Remember: Imagine a world where any kind of recording can be falsified. Memories can be implanted and any kind of genetic trace can be created. Fight against organized crime becomes nearly impossible. Sean is among the last investigators who have not given up this fight, but this determination has its toll. Mœbius relationship: A story that runs in parallel in different times. A young Ph.D. physicist student in the future. An old man in the 19th century. A young woman found on the streets in the present. Their unusual relationship folds out without boundaries. Good one. When is the next book expected? For now, I plan to do about one book per year. Also considering including other authors and turn it into an anthology.